How's Dark Souls Looking on Xbox 360? I've spent a good 40 hours or so with Demon's Souls spiritual sequel Dark Souls over the two weeks, almost all of it on the PlayStation 3. It's been hard to tear myself away from the game as I slowly inch toward progress and gains in power. But I did manage to rip myself away from my main character and invested a few hours with the Xbox 360 version, which did not ship in Japan. How does Dark Souls on Microsoft's console hold up? Pretty good so far. I've advanced far enough in Dark Souls for the Xbox 360 to battle its dual Belfry Gargoyles and been happy with the game's performance. Save for a few, unexpected frame rate hitches in the game's opening level set in the Undead Asylum, Dark Souls for Xbox 360 appears near-identical to its PS3 counterpart. But Dark Souls early-game moments are not the most console-taxing. It's when the game moves into more open areas, like a large forest or a swampy shantytown, that even the PlayStation 3 version has some trouble keeping up with the complex geometry and long draw distances. 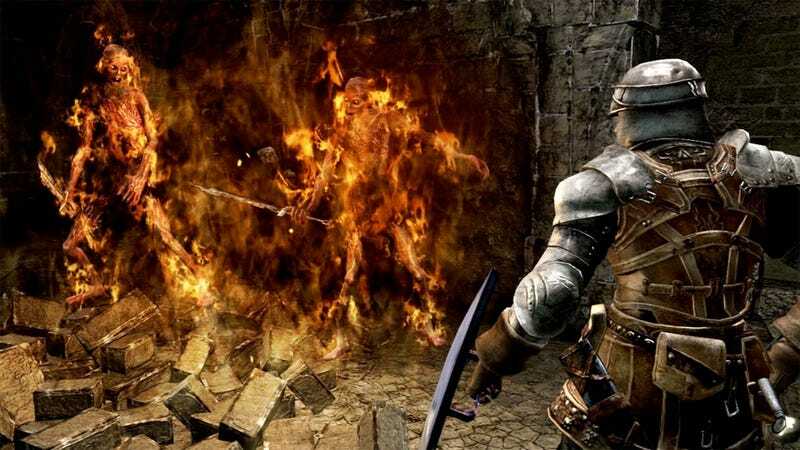 Demon's Souls players are likely familiar with that game's notorious dips in frame rate in areas like the Valley of Defilement and portions of Stonefang Tunnel. There are equivalent areas in Dark Souls where hardware and programming doesn't keep up with From Software's ambition. It will take some time to get to those areas (again) on the 360, and we'll have a full rundown of any performance hiccups in Dark Souls' full review. Curious players have also wondered about how Dark Souls on Xbox 360 will handle Party Chat and Private Chat functionality. Well, the game does not support player-to-player voice chat over Xbox Live. At all. No real surprises there. However, if players engage a Party Chat session, Dark Souls will instantly kick you out of your current game and boot you to the main menu. "Cannot continue game while you are in party chat. Returning to title screen..." reads on on-screen prompt if in a chat session. It's similar to the way Dark/Demon's Souls handles network connection interruptions for players who take those games online—you're booted to the main menu, with your progress, location and world state saved. Control-wise, switching from a DualShock to an Xbox 360 controller was no issue. The game controls just fine with Microsoft's standard pad, with only the consistently poorly performing d-pad on the Xbox 360 controller giving me any trouble. On a personal note, one oversight in the Xbox 360 version that bummed me out was—from what I've seen—the lack of Avatar awards. No "Onion Knight" armor or Gargoyle pet accessories, From? Come on, guys! I'd love to brag about killing high-level demons with some fancy Avatar clothing. Outside of that one complaint, the Xbox 360 version seems to hold up quite well in early testing. We'll have a more comprehensive look at both versions as we get closer to Dark Souls' launch. For a longer look at the PlayStation 3 version of the game, read my Dark Souls impressions from last week.